In 1894, the American Hermann Casler invented the Mutoscope. It was the first machine that applied the simple principle of persistency of vision studied by Muybridge and Marey. Casler put together on a wheel mechanically leafed through pictures taken with a Mutograph (one of the first photo camera). After eventually inserting a coin in the device, when turning the handle at the speed of 16 to 18 pictures a second, you give the illusion of motion. Two American, Coleman Sellers and George Burnham, patented as soon as 1861 for a device called Kinematoscope that anticipated this principle but based on stereoscopy (invented in 1832: when looking at two slightly different pictures, you see it in three dimensions). 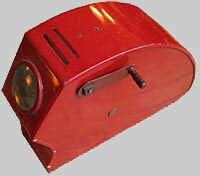 The Mutoscope was in a way the first flip through machine or viewer. Even if it was not a flip book, that the device flipped over; the other machines after all followed this simple principle. Casler registered a patent on 21 st November 1894 in the US and they accepted on 5 th November 1895. 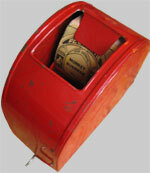 The Mutoscope knew a quick success in the US in what we call the “Penny Arcades”, sort of gaming room of the time. In England, they called it after one of the most famous picture wheel: “What the Butler Saw”. It was very popular until about 1910, when the competition with the movie shows became disastrous to it, even if it was still in use afterwards. On 30 th July 1895, Hermann Casler registered patents in Paris (n°249.286) and London for what he still called a Mutoscope, but in an extremely simplified version, closer to what we later on called a “viewer”, a simple flip through machine. 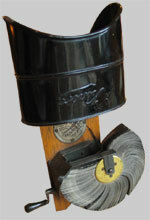 On 4 th May 1897 in France and 19 th May 1897 in England, he patented again for improvements of his Mutoscope. On 10 th August 1896, Charles Auguste Watilliaux and Siméon Clarapède got a patent in Paris (n°256.039), for a « device giving the illusion of movement through the quick succession of photographs or drawings ». He used the chronophotography of Georges Demeny. The illustrations show clearly the working of the device. It was probably the first device of a small size that applied with a very simplified system the principles of the Mutoscope 1. Charles Auguste Watilliaux developed his folioscope earlier (see History) and foresaw that he could apply the device « to photographs or drawings displayed on a cylinder like the system of books known for a long time under the name of magic books, which edges are cut in a way that when you flip over here or there, you see this or that subject ». He compares it to the Magic Books, but we already mentioned how far they are from the flip book, the act of flipping through excepted. On 11 th September 1896, the Englishman Arthur Andrew Melville- who ten years earlier patented a project for a “ Living Picture Book ”-, registered another patent (British Patent , n°20.136) entitled « A New Device by which the Leaves of Picture and other Books may be Turned Over in a Regular Manner ». It was this time, as the illustration shows, a very simple system to flip over a real flip book. On 17 th August 1897, Charles Auguste Watilliaux got a new patent (n°266.424) for an almost identical device than the one of the year before, but this time called “Cinébaroscope”. The main difference was that a mirror reflected the pictures and that you saw them through a little window. In 1898, the Englishman Henry Short patented what he called the Filoscope, a kind of mini Kinora, but there was no handle anymore. The hand turned on the pictures' rack now only flipped through by a metal piece. Images are not on a wheel anymore: we are closer to the actual flip book. 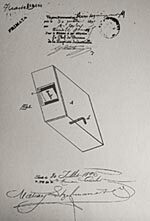 In 1898 appeared a French viewer patented by a flip books' manufacturer named Léon Beaulieu ( 9 march 1898 patent). 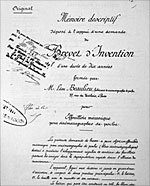 He called it “Effeuilloir mécanique pour cinématographe de poche”. He made it to really flip over a flip book that you inserted inside and that, as for Short's Filoscope, only the hand could handle. Probably at the same time, Léon Gaumont invented another flip books' viewer. He realized also another more sophisticated Filoscope that he called “Kinora à main”; he added a handle to hold it and a magnifying glass to have a better vision of the photographs. There is a copy of Gaumont viewers in the Musée des Arts et Métiers in Paris 5. In 1900, a French toy manufacturer produced a « Cinématographe». A handle inside a parallelipedical cardboard box actions pictures assembled on a tape in a continuous loop. A ball placed inside puts pressure on the pictures' tape. The pictures go up successively when using the handle; it gives the illusion of motion. 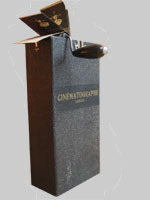 Our copy is not in its original box, but according to Pascal Pontremoli3, the instruction use stuck inside the lid is in three languages: French, English and German and specifies that « The Cinématographe-Jouet is the most simple and efficient device made until today to reproduce animated scenes. To turn it on, you just have to put on the winch the selected collection; insert the counterweight ball and leave the whole thing inside the device. Always hold the Cinématographe-Jouet vertically ». The Jouets R.J.L. manufactured another version presented in a red box and called “ cinescenic-Dessin Animé”. 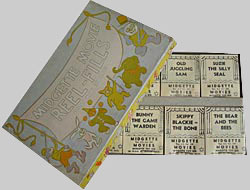 The box is brown and the strips inside are drawings that can be considered as the ancestor of the cartoon. The use of the words Dessin Animé is evidence that they produced their toys many years after the other. Instead of a ball, the counterweight is a metal cylinder. The other small hand viewers appeared at the beginning of 20 th century. One is German, dated 1913 and called “Kinophot. Das lebende Portrait in der Tasche”, published by Samson & Cie, it holds a flip book realized according to the Biofix principles: series of photographs of average people that went to the photographer and moved, talked, made gestures in front of the camera. 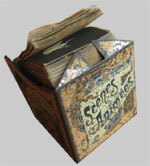 Once open, the case transforms into a viewer thanks to a moving part that animates the flip book. The second one is even simpler, as it is just a metal frame with a mobile part allowing flipping through the flip book inside. Found with a flip book of the Olympia theatre Jacques Haïk inside (same conception as Biofix's), it is probably from the end of 20's because Jacques Haïk took over the Olympia in 1929 to transform it into a movie house and had severe difficulties as soon as 1931. Americans “Viewers” designed to children are also from the beginning of 20 th century. The first one ever mentioned is a make-it-yourself Mutoscope: “A Mutoscope for Boys and how to make it” by Theodore Brown that was in the issues of Boys Own Paper of 16 th and 23 rd February and 9 th and 16 th March 1901 6 ; he used the Gies & Co flip books (like The Yankee Cop ). They extended after World War I. Midgette Toy, established in Boston , realized and distributed most of them in the 20's or 30's. On the wheel, activated by a handle, we can insert four flip books that we flip through one after the other to follow the action. The drawings are from an unknown illustrator, probably an employee of the company. They sold the viewer with four flip books and proposed another box of eight extra flip books. We also found a negative shot in copper that used to print the covers of the flip books. Another American toy manufacturer, Peco, established in Groton near New York, also used some of these flip books. 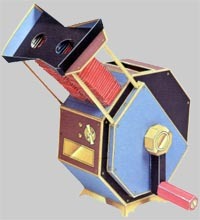 The “Peco Movie” viewer is on the same model and allow to leaf through four flip books. Only the shape and the handle are different. 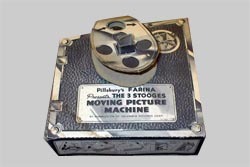 In 1937, the brand Pillsburg Farina proposed a cardboard flip through machine in kit form. Assembled without glue, the brand offered them to costumers if they bought its products. In 1938, Pepsodent proposed the same with recto verso pictures of two stories: Snow White and the Seven Dwarfs and Mickey Mouse and Donald Duck under Walt Disney copyrights. 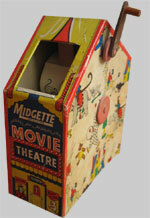 Midgette did a cardboard version of its viewer (copyright 1942) called Midgette Movie Theatre . It was the same principle than the metal version and Midgette published the same flip books again. In the same way, they proposed an extra box with the viewer's same style of drawing. This German viewer, called Rotofoto, is probably from the period between World War I and World War II. It is a kind of small Mutoscope. The pictures are on a wheel and flipped through with a small handle. The French “Cinécoloral” is probably from the 50's. 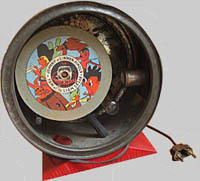 Like the Mutoscope, it uses the principle of the wheel with a light inside and can flip over what is like a real cartoon. 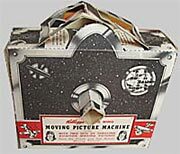 However, unlike the Mutoscope, it shows the pictures onto an outer surface thanks to its lens. 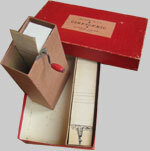 Around 1955 appeared a box that incorporated a folioscope with a handle made by Carlier, a cardboard manufacturer in Fourmies (Nord , France). He called his “boîtes-à-jouer” “ Ciné-Bop ”. Made of soft cardboard and filled with candies, the windows with rhodoïds allowed looking inside. 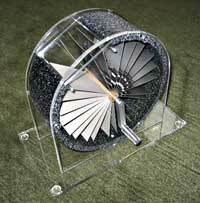 A wire handle that moves the pictures around the axis activates the folioscope. Etienne Roth drew the pictures. According to Pascal Pontremoli 7, there are at least eight different: « Dans l'astronef », « Le Satellite artificiel », « Les Martiens arrivent », « Hep ! Taxi », « Be-Bop », « Le trésor de la mer », « Guerre dans l'espace » et « La fusée interplanétaire ». We found the six firsts. 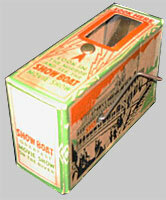 Of the same years is the viewer “Show Boat” made of cardboard by the Anchor Manufacturing Company established in Springfield , Missouri. There is a rolled pictures' strip inside that a handle should activate. More recently, Kellogg's distributes with its products a make-it-yourself viewer, it is almost the same as Pillsbury Farina's and Pepsodent's, and it is only smaller. 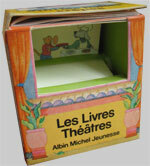 In 1984, the company Intervisual Communications Inc. in Los Angeles commercialized some « Livres Théâtres »; Albin Michel Jeunesse published the French version. There are three. The finger turns the pictures' wheel on. In 1990, the monthly children magazine Schtroumpf offered in 10 th August issue, a “schtroumphoscope” in kit form 8. It is a viewer, which recto verso pictures turn around a pencil on the same principles as the one of Kellogg's. Artists also realized flip books or mutoscopes. We saw some of them realized by Robert Breer in 1964 during the exhibition “Daumenkino. 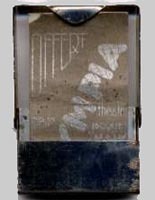 The Flip Book Show” that took place in Düsseldorf in 2005. Another one is reproduced in the catalogue; it was exhibited at the Whitney Museum in New York in 1980. In the 1990's, Norman Colp made some mutoscopes that took over some of his flip books he realized at the end of the 70's. They are extremely well finished and work to perfection. 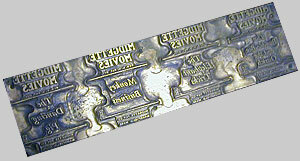 Some are single pieces, others only produced to 10 copies. Here attached, the copy of our collection takes over the flip book Steam: My View from P.S.1. He realized it in 1994 and it is a single piece. At the turn of 20 th century, we found three viewers in kit form. Derek Read in England realized the first one in 1996; it is a mutoscope that he called a “Mutascope” and distributed by Robenau Toys. The second one, in black and white, produced by the Deutsches Filmmuseum of Francfort (1997), called Moving Picture Machine , is exactly the same as Kellogg's and Pepsodent's. The third one, German too, produced by Bären Presse under the name of Papier-Kino (2001) is very original (www.baerenpresse.de). In 2001 too, the famous comic artist Chris Ware, author of Jimmy Corrigan , published in the n°15 issue of his magazine The Acme Novelty Library, a “Professional Futuristic 3-D Picture viewer”, a cut out viewer with a very original shape. 1 Mentioned a few months later in « Le folioscope mécanique », La Nature, supplément au n°1232, 9 janvier 1897. 2 : The Kinora Library. A descriptive List of Moving Pictures that you may see in your own home, Hastings, The Projection Box, 2001. See also Barry Anthony, The Kinora. Motion pictures for the home 1896-1914, London, The Projection Box, 1996. 3 : Pascal Pontremoli described the toy in « De l'animoscope au zootrope », Le Vieux Papier, 1997. 4 : Found in Catalogue Jouets Étrennes 1906 des Magasins Aux Trois Quartiers par Pascal Pontremoli, op. cit. 5 : See it in the section Communication of the Museum under inventory numbers 16964-0001 and 16964-0002. There is another version of the Kinora at the Gaumont museum. 6 :Described by Stephen Herbert in Theodore Brown Magic Pictures. The art and inventions of a multi-media pioneer, London, The Projection Box, 1997.